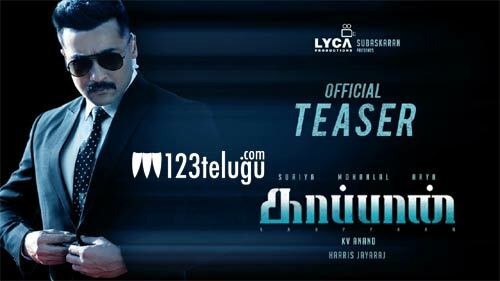 On the occasion of the Tamil New Year, the makers of star hero Suriya’s upcoming film, Kaappaan, unveiled the film’s much-awaited teaser. Kaappaan’s teaser is grand at action-packed right from the start and ends on a thrilling note. The film is extensively shot in London and New Delhi. In Kaappaan, Suriya dons several avatars, including a bomber, a naive villager, a handicapped Muslim man and an NSG Commando etc. Suriya’s role will be the surprise package of the movie. Malayalam star Mohanlal as an honest politician and Bollywood actor Boman Irani, young stars Arya and his wife Sayyeshaa essayed crucial roles in the movie. Kaappaan has been directed by Rangam fame KV Anand and produced under Lyca Productions banner. Harris Jayraj is the film’s music composer. Kaappaan will be hitting theaters in the second half of this year.